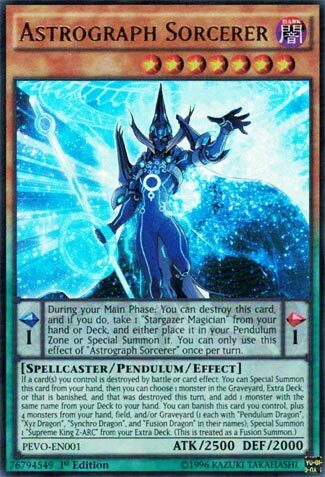 Pendulum Effect During your Main Phase: You can destroy this card, and if you do, take 1 “Stargazer Magician” from your hand or Deck, and either place it in your Pendulum Zone or Special Summon it. You can only use this effect of “Astrograph Sorcerer” once per turn. Astrograph Sorcerer, while a Spell card can destroy itself to search a Stargazer Magician and Special Summon it or place it in your Pendulum Zone. If you play Stargazer Magician, this effect is useful, but Astrograph’s monster effect I think is far more useful. If one of your cards gets destroyed in any fashion, you can Special Summon Astrograph from your hand. That alone is a great effect and can combo with cards like Time Pendulumgraph and Double Iris Magician to gain a lot of pluses. The effect continues though, allowing you to add a card with the same name that was destroyed the turn you activate Astrograph’s effect. You run multiples of several cards in the deck, there is no reason why you shouldn’t break even off the destruction of a card if you Special Summon Astrograph. The Supreme King Z-ARC effect we won’t get into, it is too hard to come by and rarely (if ever) will be of consequence to a player. Astrograph has high ATK behind it, is a scale of 1, so it combos with Double Iris to complete your scales. Astrograph I feel is up there with Double Iris as the engine that drives the Pendulum Magician archetype. Astrograph Sorcerer is not a Magician Pendulum Monster. It’s a Level 7 Dark Spellcaster-type Pendulum Monster with 2500 Atk and 2000 Def and Scales of 1. It’s Spell Effect does let you search or Special Summon a Stargazer Magician from the deck if you destroy Astrograph Sorcerer during your Main Phase. The Monster Effect is significantly better letting you search a single monster that was destroyed this turn. Astrograph Sorcerer Special Summons itself from the hand and then you get the search. Finally, this can Fusion Summon Z-Arc properly if you have the materials in your hand, field, or grave. All the effects work together in a Pendulum Magician deck, but there is also good utility in other decks because of the searching monster effect. It also helps that Z-Arc can win games so Astrograph Sorcerer has enough options to be a great card. The stats aren’t terrible either. Next up in the line of powerful cards in the Pendulum Magician deck is Astrograph Sorcerer, one of the most important cards in the Pendulum Magician deck. Astrograph Sorcerer is a scale 1, which is good as a low scale, and you can destroy it to get a Stargazer Magician from your deck and either Special Summon it or put it in the scale. This is a hard once per turn. Thinning the deck is good, but Stargazer isn’t too great as either a scale or a monster, so you don’t really worry about this part. As a monster, if a card you control is destroyed, you can summon this card from your hand and search for a card with the same name as a card that was destroyed this turn. Wisdom-Eye Magician comes to mind, Double Iris is another good card for this. Any searching is outstanding and this really excels when used with Heavymetalfoes Electrum, the plusses are just insane once that Link Monster comes out. Also, you can banish this card along with a Pendulum Dragon, Xyz Dragon, Synchro Dragon, and Fusion Dragon monster to summon Supreme King Z-ARC from the Extra Deck as a Fusion Summon. If you are playing all 4 of the Pendulum Magicians in the Pendulum Evolution set, you might as well put Z-ARC in the Extra Deck, because you are playing this and Z-ARC is an outstanding boss monster. Overall, the power of this card with the plusses it can help generate is awesome. I can see it being Limited in the future, the card is just that dang good. This card, Astrograph Sorcerer is just a 1 on the Pendulum Scale (but makes it work well with yesterday’s card) and matches Dark Magician in attack at 2500, also being a Dark, Level 7, Spellcaster. If this Pendulum card is destroyed, (by you, mind you, during your Main Phase 1) you can add a Stargazer Magician from your Hand or Deck either Special Summoned to your Field, or placed in your Pendulum Zone. The Pendulum Effect, while seemingly complicated, helps you easily bring out Supreme King Z-Arc. It’s worth noting that Stargazer isn’t particularly great, but it’s still something to search if you’re playing, and that’s not a bad thing. This card combos almost too well with Double Iris, but it makes the Deck go, and go fast. It’s very easy to generate advantage in your favor with these card if you play the Deck right.